Guests aboard Zuiderdam, the first in Vista-class series, enjoy a spectacular art and antique collection, wide teak decks, elegant dining rooms and spacious staterooms-many with verandas. At the heart of Zuiderdam, suspended in a three-story atrium, is a Waterford Crystal Seahorse. While on-board, choose from an array of onboard activities that allow you to pursue new interests or relax and rejuvenate. Enjoy onboard cooking shows and The Greenhouse Spa & Salon offers spa treatments, a thermal pool and lounge and a variety of salon services. Fully equipped Fitness Center and on deck enjoy two outdoor pools, along with basketball and volleyball courts. 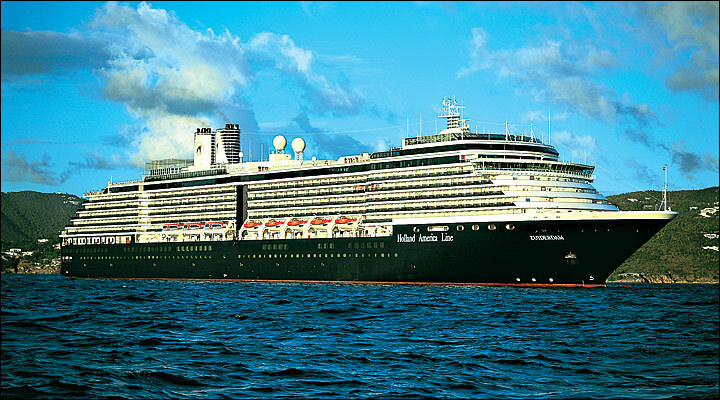 Zuiderdam guests enjoy dazzling entertainment options from their very first night on board featuring world-class musicians performing chamber music, and Billboard Onboard, rocking the house with 50 years of chart-topping hits. Club HAL® provides a wide variety of youth and teen-friendly activities for kids ages 3 to 17, supervised by qualified, full-time staff.